Erin Weckerle is a Brooklyn based painter originally from Pittsburgh, PA. She received her BFA from Tyler School of Art, and MFA from Yale University, as well as attending Penland School of Crafts, Norfolk Summer School of Art, and the Temple University Rome program. 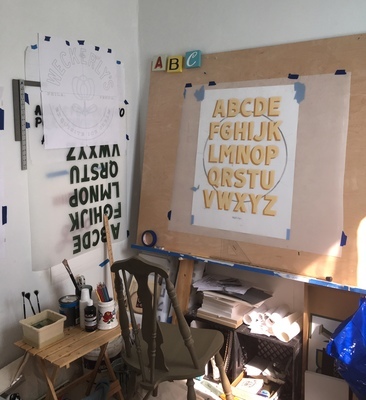 Erin's current body of work takes its point of inspiration from Pennsylvania Dutch Hex signs. She also works as a sign painter specializing in gold leaf address numbers and chalkboard art. Erin also dj's around town regularly and has a radio show called Clean Forgot.